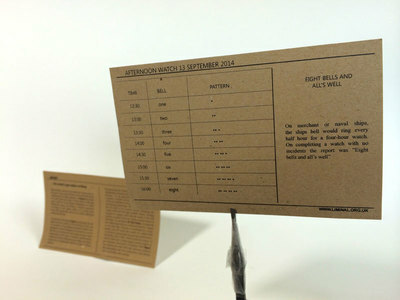 Report was made as part of a larger project of artistic research undertaken by David Prior and Frances Crow, which address the changing role of bells in contemporary culture. Where other works in this series have focused on the magico-sacred role of bells in both religious and civic life, Report focusses on the physical and sonic materiality of the bell itself. Historically, cannons and bells have been made in the same forges and in times of war, bells have been melted down to make weapons and munitions. Devised specifically for the network of tunnels that form Newhaven Fort in East Sussex, Report attempts to sonify the relationship bells have with power, with warfare and specifically, with cannons. 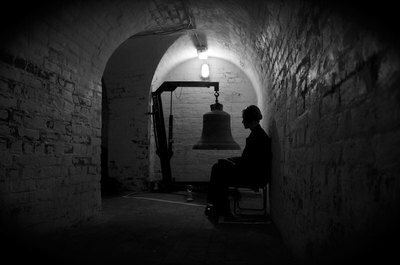 In Report, the sound of a bell takes the place of the sound of the gun and is placed in the heart of the Eastern Magazine, at Newhaven Fort. The sound of the bell filled the space, providing a visceral experience of the site, echoing both its historical function and its architectural form. Report was commissioned by Lost Property for Fort Process Festival, Newhaven Fort, East Sussex, UK.